Field Notes just announced their newest limited edition notebook, (and their 36th), for the fall of 2017, The Dime Novel Edition. An homage to an 1860s American publishing phenomenon. "After lots of research, reaching out to experts, and purchasing a few examples from collectors, we became obsessed with the form of the Dime Novel; the typesetting, the printing, the compact size, the paper stock, and the sewn bindings." The Dime Novel goes back to the 1860s New York, where the Beadles brothers created these budget-friendly 100 page novels that were available at any newsstand and became quite popular and eventually topped 300 titles, each selling 35–80,000 copies. 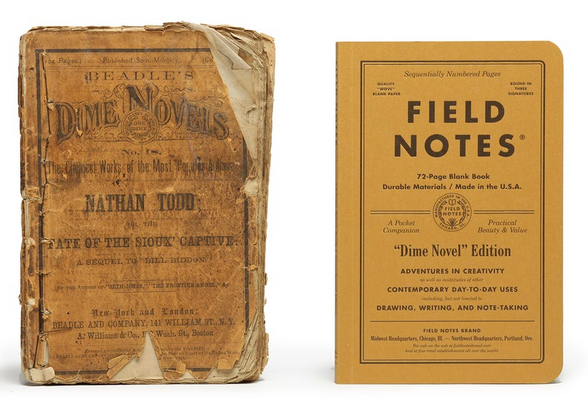 Field Note's version reproduced the look of the Dime Novel and created a notebook inspired by the typesetting, compact size and iconic dusty-orange covers. 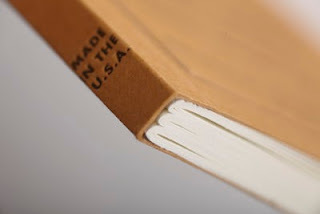 Perfect for drawing, writing and note-taking, the 72 body pages are Smyth-sewn in three, 24-page signatures with Coats Dual-Duty thread, then securely glued into the cover. Field Notes Quarterly Release - Fall 2017 - Dime Novel from Coudal Partners on Vimeo. For more information on the new Dime Novel Edition visit Field Notes online here.